It is nothing short of stunning how little we hear about Gaddafi these days. Articles in papers, posts on blogs, discussions amongst friends – virtually everywhere, even in discussions about peace and justice in Libya, Gaddafi is no where to be seen or heard. It is just bizarre. I realize that, in reading the above, readers may think that I have gone off the deep-end. After all, few people have commanded so many headlines in recent weeks and months as Gaddafi! The focus of this post, however, is not Colonel Muammar Gaddafi but rather his son, LSE alumnus and fellow ICC-indictee Saif al-Islam Gaddafi. It is not simply that his role in peace negotiations and his fate in a post-conflict Libya remain unclear – Saif’s role and fate have been entirely ignored. The International Criminal Court predictably takes a similar stance. Unfortunately, both Dicker and the ICC fall into the same trap as so many other observers and reporters – exclusively focussing on the fate of Col. Gaddafi. While the world zeros in on father Gaddafi, however, it is his son, Saif al-Islam who may pose the greatest threat to international justice. Prior to the ICC arrest warrants being issued, it was the belief and hope of many international diplomats that Saif al-Islam Gaddafi could be the leader of a reformed and increasingly progressive Libya. Saif is an LSE alumnus who had spoken and written positively about democratization and the role of civil society. He had become cozy, perhaps too cozy, with Western leaders and diplomats. He leaned West and many attributed Libya’s abandonment of its nuclear program to what they viewed as the moderate, reasonable and reasoned son of Gaddafi. According to numerous accounts, many government officials in the West expressed regret that the ICC had decided to indict the man they saw as a possible partner in a post-Col. Gaddafi, post-crisis Libya. Since the ICC arrest warrants for the “Tripoli Three” were issued and since the shock value of an LSE-alumnus being pursued by the Court diminished, very little has been written about Saif al-Islam. This may suit Western governments just fine. As I have previously argued, it is entirely possible that these governments continue to view Saif as someone they can negotiate with. Certainly their silence and their about-face regarding the fate of Col. Gaddafi suggests the issue of Saif’s indictment does not stand in the way of him having a role in post-conflict Libya! The rebels’ National Transitional Council (NTC) has also made no rigid demands on either Saif’s place in peace negotiations nor his fate once the war concludes. Like external parties, their focus has been solely on excluding Col. Gaddafi from any negotiation. If, as reported, Col. Gaddafi may be allowed to stay in an adjacent room during negotiations, it seems even more likely that Saif al-Islam will have his place at the negotiating table. Who, after all, would the Colonel trust more to represent his interests than his own son and de facto number two in Libya? Given the military stalemate, peace negotiations in Libya will almost surely result in some form of a power-sharing agreement between pro-rebel forces and the Gaddafi regime. The attitude of both the NTC and the international community appear to be setting the ground for Saif to hold a significant position, if not a key leadership position, within a power-sharing deal. Advocates of international criminal justice and the ICC in particular should be wary of the role Saif plays in peace negotiations between pro-Gaddafi forces and the rebels. Just as importantly, they should start talking about it. By focussing myopically on Col. Gaddafi’s role and fate, international organizations, human rights advocates, governments and diplomats inadvertently create the space for Saif to emerge as a key player at the negotiating table and in post-conflict Libya. While his name and face may not be plastered on newspapers around the world, it is Saif al-Islam Gaddafi who may, in the end, undermine international criminal justice the most in Libya. This entry was posted in Amnesty, Crimes against humanity, France, International Criminal Court (ICC), Libya, Libya and the ICC, The Tripoli Three (Tripoli3), United Kingdom, War crimes. Bookmark the permalink. 4 Responses to Peace, Justice and Libya – the Gaddafi who Threatens it All? It seems that this article has been written on the assumption that the ICC actually does have a case against Gaddafi or his son, even after part of the “evidence” submitted to the ICC has already been rubbished by such organizations as the HRW. Of course, failing to review exactly what the evidence was, the writer of course concludes by demonizing the character of Saif al Islam. If the writer had done his homework he would be surprised at some of his findings, namely the struggles this man faced in trying to transition Libya towards a more open society in the last 3-5 years. Anybody who follows Libya knows who Saif al Islam is, and thus sees the blatant propaganda campaign to destroy this man’s character and past work was part of the work required to path the way for a military intervention that was never “humanitarian” in any way. Unfortunately, the writer of this article has fallen for the trap. I think, if you read this post carefully, the point is not to demonize Saif al-Islam Gaddafi, but rather to question why his role in Libya has been ignored and put it into the context of international criminal justice. I would be interested in any information you have regarding “the struggles this man faced in trying to transition Libya towards a more open society in the last 3-5 years.” I would also be interested in any information you have that would absolve Saif from any international crimes, which you imply you have. Also, out of curiosity, do you support Saif’s view of the civil war based on tribal factions and drunken/drugged Islamists and that the Gaddafi regime, of which he is an integral part, has not killed any civilians? Regarding your 3rd question – I’ll leave my reply to you with this – yes, there are tribal disputes (example : the rebels in the Western Mountains don’t seem to be on par with the TNC. Different tribes in the Western Mountains show dispute among themselves. A recent example is the current problem Benghazi is facing with the Obeidi tribe). I invite you to look thru Reuters and AP for details. I wouldn’t call the rebels drunks/junkies (that’s simple propaganda, and if the West does it…). But I will say that I believe many of those fighting with the rebels hardly understand who/what exactly they are fighting for. And i’ll submit this – if the country was to be divided and the first foreign army base is set up in the East (because only a fool won’t see that one coming) do you really think those supporting the rebels will not turn? And how about Egypt? 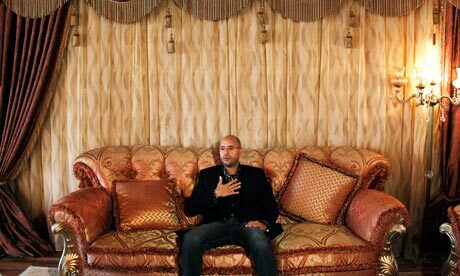 As for information regarding the work Saif al-Islam has done, there is plenty of info around from outside sources, namely those that worked on the board of the Gaddafi Fund with him who mention some curious details about their last meeting and why it had been held outside of Libya in December 2010. HRW working in Libya before the troubles has submitted a number of reports about his work and the problems he faced from within the regime – remember there is a National Congress. Here’s a small, imperfect example – who headed the Ministry of Justice that convicted the Bulgarian nurses to death-row? And who got that overturned? A second example that might make some reconsider his proximity to the regime – Saif al-Islam backed the first flotilla to Gaza, funded it and apparently wanted to travel on it to deliver basic aid to Gaza. And who blocked him from participating? I don’t imply to “have” information that would absolve Saif. I read what’s available on the internet from numerous reliable sources, namely the HRW. What I question is those who say there’s enough to indict him. What sort of info is most reliable? “Testimony” from prisoners of war? “Testimony” from rebels? My favorite was the Viagra story. Now really. This war did a number of things to “international justice” and “humanitarian missions” – it proved that the ICC, for example, is a tool that can be used/manipulated to gain an upper hand for its makers. And “humanitarian missions”? No such thing. Of course, most people discounted the ICC for never once questioning what happened in Iraq. And i’m with them. PS – Regarding the question of civilians killed since Feb 17th. I’ll remind you that within 36 hours, rebels in Benghazi had attacked an army depot and armed themselves. During those first 36 hours, nobody is denying police shot at protesters. 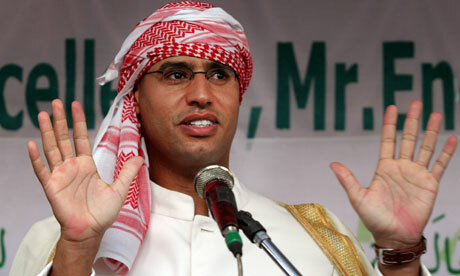 Not even Saif al-Islam. Its the numbers that are off though. Once civilians arm themselves and attack police and army quarters, as we all saw, any army in any part of the world would have the fundamental right and duty to withdraw armed insurgency from the streets. A site called “Justice in Conflict” should really be questioning what we’re told from both sides. Not just one. To find justice. Even if it looks bad on our side. There was a preliminary investigation of possible war crimes by British servicemen in Iraq that was conducted by the ICC.